Do you run a cleaning service? Planning on starting one? Every good professional cleaner needs a high quality and also the best commercial vacuum cleaners in their toolkit. That's why a commercial grade vacuum are capable of providing peak performance power and suction even after years of heavy use. They are typically sturdier than standard vacuum cleaners intended for home use, and are designed to outlast and out clean other vacuums even when used for hours at a time on a daily basis. Also, a heavy duty vacuum is also designed to pick up and store more dirt and dust than a standard vacuum because they are often used to clean in offices, restaurants, and other high foot traffic businesses. Choosing the best vacuum cleaner for your business is critical to maintaining a high standard of cleanliness with a minimal amount of downtime and cost for maintenance. To help you make an informed purchasing decision, here are our top ten good commercial vacuum cleaners currently available. What Is A Commercial Grade Vacuum Cleaner? Which Is Best Bagged or Bagless? Famous for advertising their flagship model by using it to pick up a bowling ball, Oreck is a household name throughout the United States. They build simple, high quality upright vacuums that clean thoroughly and efficiently. This Commercial Upright U2000R1 is simply a ruggedized extension of their already outstanding products. What most users note first about the Oreck model is the comfortable, ergonomically designed and easy to use Helping Hand handle. Oreck’s unique patented design earned them an Ease-of-Use Commendation from the Arthritis Foundation, and at 8 lbs. it is also one of the lightest vacuum, and it's designed for commercial use, too. Furthermore, this Oreck vac comes equipped with a 40 foot power cord for cleaning larger room and a multi-floor cleaning system that uses their Microsweep technology to deep clean both hard flooring and plus carpet. Better still, the side edge brushes allow you to clean around furniture and close to walls without the need for a crevice tool. If you do small scale commercial cleaning in a small-to-medium sized office building or restaurant, the Oreck Upright is an excellent addition to your cleaning kit that will provide you with years of faithful and effective cleaning service. As the first name in vacuums since the mid-20th century, Hoover enjoys an outstanding reputation for high quality commercial and standard use vacuums. Their CH30000 PortaPower Lightweight Canister Vacuum is ideal for anyone who needs to vacuum under or around furniture on a regular basis. So the canister vacuums are also the ideal choice for cleaning drapes, curtains, and furniture if you work regularly cleaning residential homes or office buildings. Additionally, the ability to carry the vacuum over your shoulder and use it in tighter spaces gives it a distinct advantage over most upright vacuums. Moreover, with its 33-foot power cord the Hoover CH30000 PortaPower can reach just about anywhere you’d need to take it in a regular sized store, restaurant, or office. The CH30000 also includes a reusable cloth vacuum bag that allows you to create less waste while cleaning, but it still retains the ability to use disposable paper bags as well if those are preferable for your specific cleaning needs. Additionally, you can swap the included extendable cleaning hose from the suction port to the blower for added cleaning versatility. The Hoover CH30000 makes an excellent backup vacuum or close up cleaning vac for home or commercial cleaning. Ready for the big leagues? 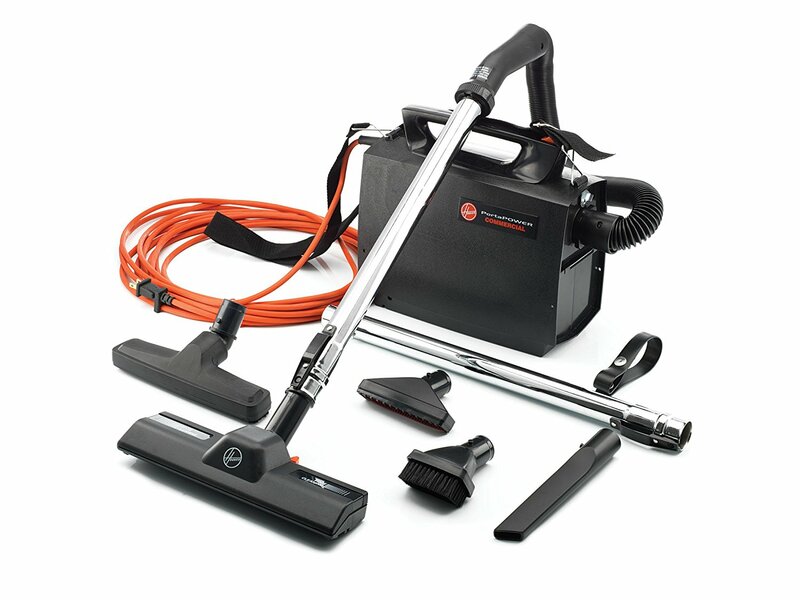 ProTeam’s Super CoachVac is a industrial strength vacuum cleaner designed for cleaning vast square foot areas. The manufacturer claims one person operating the Super CoachVac for an hour can vacuum nearly 7500 square feet, making it ideal for commercial cleaners who routinely have to cover multiple floors and large rooms like college campuses, banquet halls, event venues and convention centers. With a ten quart capacity, the Super CoachVac can hold nearly 3 times the amount of dust, dirt, and debris that the average commercial upright vacuum. Thanks to its 1188-watt, 9.9-amp motor, this commercial grade vacuum also got plenty of power to get up the mess regardless of what you need to clean up. Furthermore, the 50 foot power cord allows the operator to move further and clean more areas between electrical outlets. It’s also one of the quietest vacuum in its class, rating at just 66 dBA. So best of all, its built-in HEPA filter ensures that exhaust air isn’t adding contaminants back into the atmosphere. This professional vacuum cleaner has the reach, power, and features you need to take on those bigger cleaning jobs that would otherwise take far too much time to clean with a regular vacuum cleaner. For professional cleaners and facilities staff, you definitely won’t find better than the ProTeam Super CoachVac Vacuum. Ergonomic design is critically important when it comes to cleaning at home or for a living. No one wants to injure themselves due to repetitive stress on their joints, back, and limbs while cleaning, yet these injuries are all too common. 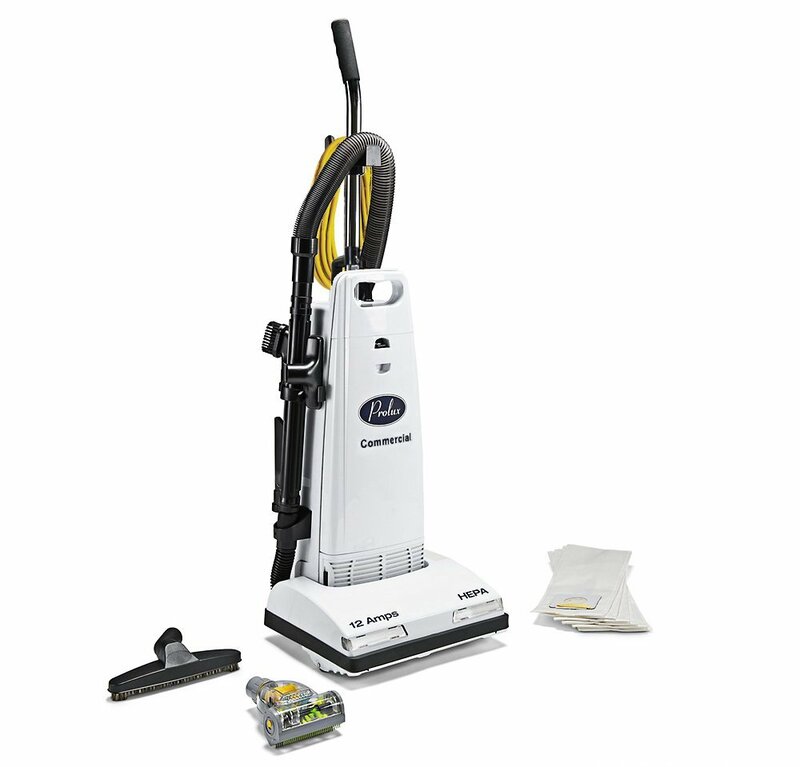 To provide a solution to these common cleaning woes, Hoover developed the C2401 Lightweight vacuum cleaner. Weighing less than ten pounds, this dual-strap mounted vacuum makes it easy to clean without causing potentially harmful strain on your body. Do you need to get into tight spaces or up around the ceiling? This backpack vacuum has you covered with an extendable hose wand and multiple attachments for getting the dirt, dust, and debris out of the hardest to reach places. 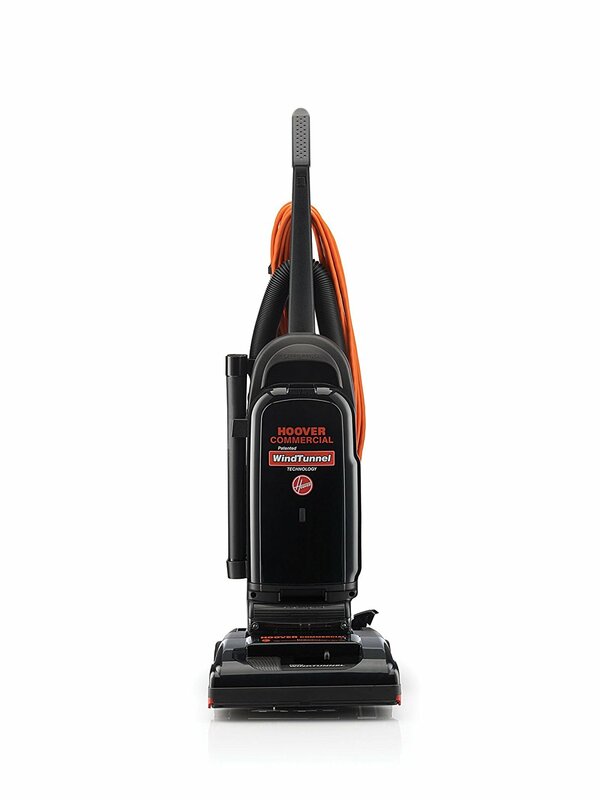 Additionally, the 48-foot cord means less time swapping outlets and more time vacuuming, and Hoover’s innovative motor and exhaust design make this one of the quietest vacuums. This compact and lightweight vacuum features a HEPA exhaust filter to prevent dust and allergens from leaking back into the air as you clean. It also includes a cloth collection bag that can be washed and reused to reduce the waste generated by regular use. Should you need disposable vacuum bags for especially nasty cleaning jobs, you can also fit a paper collection bag for faster and easier disposal. All in all, if you need a comfortable and powerful and one of the best vacs to get your cleaning done without causing a repetitive stress injury, Hoover’s C2401 makes a great choice. A good upright vacuum is a cleaner’s best friend, and there are few better than the Sanitaire SC679J. Weighing in at only 12 lbs. and capable of holding up to 18 dry quarts of dust, dirt, and debris, this powerful upright is ready to handle any floor from flat to deep pile.In addition to its vast capacity and lightweight design, the SC679J’s Tietex fabric collection bag is designed to be shaken out and reused again and again to reduce both waste and your cost to own. Thanks to its 5 amp motor, this upright also delivers 120 cubic feet per minute of airflow while only generating about 78 dB of motor noise when in operation. Furthermore, the locking vacuum head can be engaged or disengaged with a tap on the foot-switch, and it folds flat for easy access to those hard to reach spaces under furniture. Best of all, the Sanitaire SC679J features a 12-inch wide cleaning path that lets you clean more with fewer passes. If you need a good commercial upright vacuum for covering significant square footage on a regular basis, the SC679J is likely to be your best bet. Some cleaning jobs require some heavy duty cleaning power, and that is the type of vacuuming that the Prolix 6000 was built to do. This upright vacuum sports a 12 amp sealed motor that generates airflow of 125 cubic feet per minute. This motor is also insulated to dampen operational noise, and it features a suction bypass function to redirect airflow from the steel bottom plate and brush roll equipped vacuum head to the integrated telescoping vacuum wand. Just flip the vacuum into an upright position, lift the wand, and attach your desired cleaning accessory for curtains, upholstery, and light dusting. So, best of all, the Prolux 6000 comes with a washable HEPA filter and several disposable micron bags (non-reusable) to help maintain better air quality and keep allergens and dust from escaping back into the air as you vacuum. For a powerful commercial vacuum ready to handle extended heavy use on all kinds of flooring, the Prolux 6,000 makes an ideal choice. The Hoover WindTunnel for home use has a proven track record of superior upright and canister style performance, and is truly an outstanding value. Hoover’s patented WindTunnel technology uses a 3-channel airflow system that lifts deeply embedded dirt and debris from any type of carpet. The Hoover WindTunnel is built upon the solid foundation established by its sister model, and even makes many improvements that have made it invaluable to professional cleaners and home users alike. The primary differences lie in the more powerful, commercial grade motor built to withstand long hours of heavy use on a regular basis. Additional changes include a commercial grade 3-prong durable and tear/friction resistant power cord, non-marking furniture bumper guards and non-marking commercial grade urethane wheels. There are also five floor height settings to choose from, and when locked in the upright position the WindTunnel becomes a canister vacuum cleaner with an extendable wand for cleaning curtains, upholstery, and dusting those hard to reach nooks and crannies. Edge bristle brushes for getting into the tight spaces along baseboards complete, making this a thorough upgrade to the standard home use model. The Hoover WindTunnel is an exceptional choice for any professional cleaner or home user looking to get more out of their vacuum cleaner. In many cases, an upright vacuum cleaner just isn’t a good option for certain cleaning jobs. Detailing cars, vacuuming staircases, and working in tight spaces to clean out the collected dust and debris requires more reach and less cleaning area. When you’ve got to clean around many obstacles with limited maneuvering room, you need a commercial grade canister vacuum cleaner like the Sanitaire SC3683B. At just ten pounds, it’s easy to wheel around behind you as you work, and it takes up less space. With the accessory kit and extension wands clipped together and ready to go, you can easily clean large areas of carpet or hard flooring quickly and easily. Moreover, if you need to clean or dust on high shelves or around the corners of the ceiling, all you need to do is clip in a wand extension and you are ready to go. Additionally, the specially designed wide vacuum head for cleaning larger areas also has an airflow driven beater brush to draw up ingrained dirt and debris from even deep pile carpets. The greatest advantage of the SC3683 is its quiet in operation. Cleaning quietly without generating a tremendous amount of noise is important too, and it never hurts to have a quieter vacuum cleaner to protect your hearing, too. 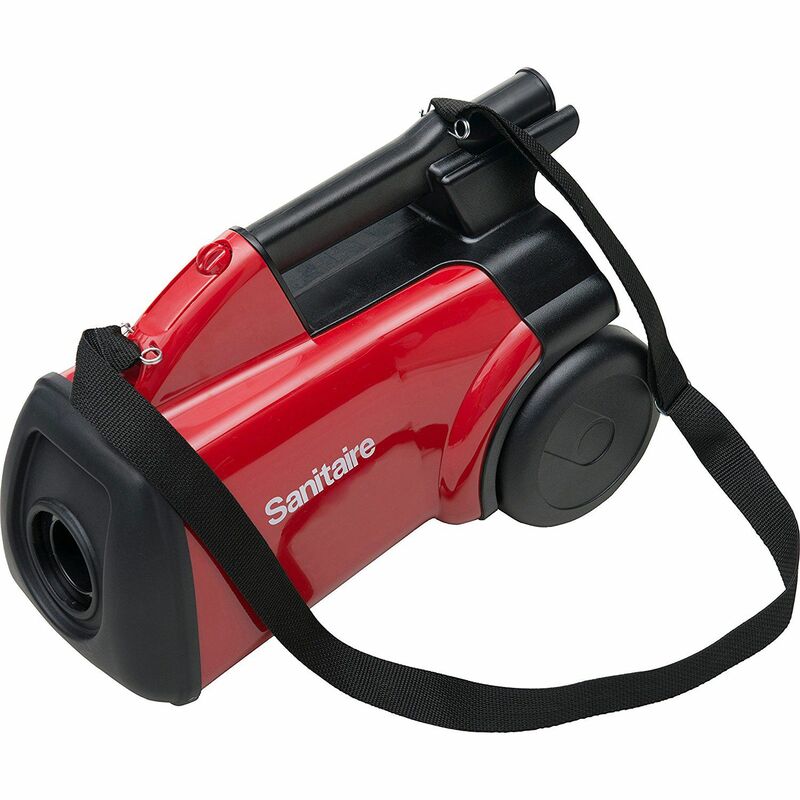 Bottom line, the Sanitaire SC3683 is a great option for anyone who needs a good canister vacuum to supplement their upright, or who does significant amounts of cleaning window treatments, furniture and stairs. Need a restaurant vacuum for your business? ProTeam designed their ProVac FS 6 specifically for cleaning up in a food service setting. Not only is it lighter than their behemoth Super CoachVac, but it also has an improved, more breathable harness for better balance and comfort while in use. So, like most ProTeam vacuum cleaners, the FS6 also sports a 50-foot electrical power cord to minimize outlet switching while cleaning. Thanks to its lengthier power cord and 6 quart collection canister capacity, the FS 6 allows users to clean nearly 3 times the floor space per hour compared to a traditional upright vacuum. Working smarter rather than harder has never been easier. What makes this a truly ideal restaurant vacuum is the addition of advanced filter in both the collection bags and the integrated HEPA exhaust filter. Not only can you get more cleaning done in an hour, but you can also improve the air quality of your cleaning location, too. Best of all, the included attachments and tools are all designed to make cleaning in a food service session much easier compared to less efficient and capable modes. For restaurants looking to get a high quality vacuum for staff cleanup, or for professional cleaners looking to get a comfortable and efficient commercial grade vacuum, the ProTeam ProVac FS 6 is definitely one of the best options on the market today. 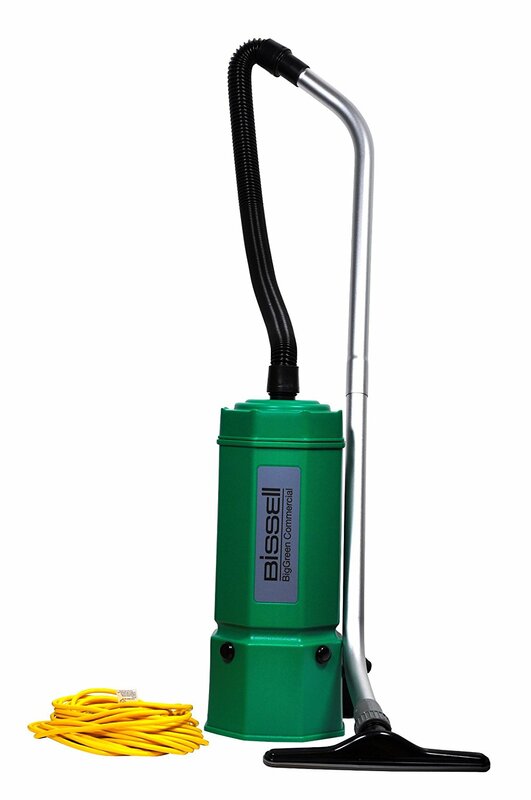 Another household name, Bissell Big Green Commercial BG1006 is a vac cleaning powerhouse ideal for all industrial grade vacuuming applications. It’s got plenty of airflow thanks to its 1080-watt motor and expansive airflow, and its 6 quart capacity means you can clean larger areas before it needs to be emptied. The 4-foot hose has swivel cuffs to make cleaning high and low places you couldn’t reach with an upright easier, and the included attachments let you adapt your cleaning instrument to each unique cleaning situation. The “Big Green” isn’t just about tools, noise ,and reach though either. This cleaner also has 50-foot power cord so you can spend more time vacuuming and less time searching for another outlet. For the small business owner or professional cleaner, the Bissell BG1006 ha everything you need to keep your carpets and floors in the cleanest possible condition without sacrificing manoeuvrability or power. Depending on the characteristics and use of a vacuum, there are some differences between a regular vacuum and one that is used for business and professional purposes. The residential vacuum is mostly used for the home cleaning solutions. These will have a short, lighter cord and will not consume as much power as the commercial cleaning vacuum. Also, the regular vacuum cleaner is specifically designed for such small and moderate use. Its capacity for dirt and dust that it will collect is a lot less compared to a heavy duty vacuum. On the other hand, the residential vacuum models are almost similar to the commercial vacuum cleaners. The other difference that comes about albeit having a nearly identical design, is the motor life and structural integrity. Some other differences will include the fact that Commercial vacuums will go through meticulous HEPA certification testing. Some other differences will include the weight, the warranty, the replacement parts, and the toolkits. For a industrial grade vacuum, they will be huge and reasonably heavy, this is because of the capacity and structural integrity of the machine. They will have more extended warranties, and their replacement parts are available, though they may be a tidbit expensive. The best commercial vacuum cleaners are also an affordable professional cleaning system due to their primary use. They are also different from the residential home vacuums. Here's some features to look for from a good quality pro vacuum. The ability to work on hard and rugged floors. Most commonly used and a popular model is a commercial upright vacuum. The cleaner functions by using a rotating brush roll or a beater bar, in a combination of sweeping and vibration to undertake the cleaning process. There are two types of industrial upright vacuum. One is a direct fan and other is a fan bypass model. With its direct fan or the dirty air, the traditional or older of the two types, it has a large fan at the opening of the suction where the dirt passes through before getting into the bag. It has a separate cooling fan. Having short air-paths, this upright commercial vacuum is more efficient since it makes use of less power. The fan bypass also known as the clean air consists of a filter before the dust gets into the bag. It joins many stationary and moving motors to do the job. This type of upright vacuum utilizes more power as compared to the direct fan. On the same, there are more recent designs that are drive-belt powered vacuum while some are have got a dual motor design. They are also common designs in use on the commercial upright vacuum cleaner. 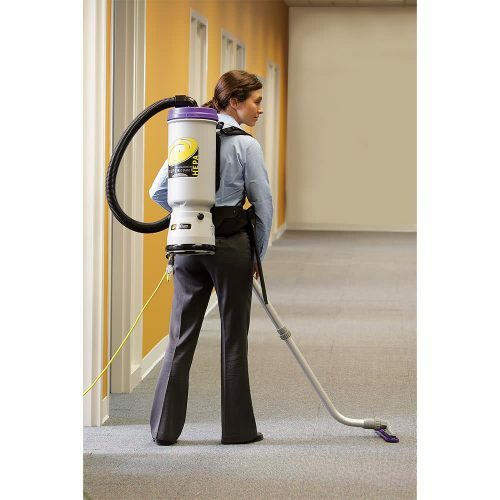 Ergonomic pads with a lightweight design and back support are the backpack vacuum cleaners. It is designed to be carried around by the user as it is lightweight and can be easily carried around for long periods of time. The backpack commercial vacuum models ensure safety in their designed and most of all, they are made to be easily used by people of all statues cause of their size and weight. With this design comes the freedom of movement. Thus the user can move around and make use of the hands to move or carry the power cord, while also managing the wand. They will also have the ability to move furniture as they clean. The canister offers flexibility and maneuverability, and is commonly used, and liked, especially since they are a more silent cleaning solution. Attached to a motor and the dirtbag is the cleaning head. It's using a rigid wand and a flexible and long hose. This cleaner has a lighter cleaning head and provides more maneuverability without the need to keep on moving the canister with every instance of cleaning. The design of the canister vac is with dust collector that is either bagged or bagless and a motor, all of which are in a separate unit mounted on wheels. The other part is the cleaning hose, as detailed above. Other cylinder models have standard power-heads as some add-on equipment with mechanical beaters. The beater will have a separate motor and may use suction power while spinning the brush roll or through a drive belt. This type of commercial vacuum is especially useful as it's flexible and can be used to clean unreachable spaces such as underneath chairs and tables. It can also be used to clean surfaces that are vertical including stairs. On recent designs, maneuverability has been enhanced with the ability for the user to switch to different cleaning modes; such as a blower on this vacuum. Hence this is just one of the features that aids and brings about an added benefit to the user, so offering more freedom. They are mostly used in commercial cleaning and are have the attribute of the professional vacuum, only this cleaner is a smaller design. While using the commercial bagless vacuum cleaners which does help to reduce the expenses since the bags used are disposable. While still on the same, the commercial vac making use of a bag will ensure that most of the dust and debris is kept contained in the disposal bag. This comes with another added advantage that is the reduced frequency serviceability or need for a filter maintenance. While it is easier to empty the bag with this vacuum cleaner, it makes it even more hygienic using the bagless industrial vacuum. With the use of this cleaner, the bags themselves will add a level of filtration therefore ensuring less filtration required during cleaning. This Bagged commercial vacuum cleaner is also a good option for those suffering from allergies and conditions such as asthma. With the use of the bagged cleaner, some demerits are also experienced, and this will include the costs of the bag. Also, the bagged is also less eco-friendly. There may also be a reduced efficiency in work time if one runs out of the bags. Also, as the bag gets full, suction diminishes. Using this type of vacuum requires regular replacing of the bags. That’s not all, you also can’t tell if the bag is full, However some types of vacuums have indicators on them so let you know when it needs changing. Using this bagless vacuum cleaner, it will save on the cost and need for new bags. Also with less waste produced as there is no need to throw away the bag. The canister won’t diminish as the dust canister is being filling. As some of the canisters are transparent, you will be able to see the amount of dust and debris picked up and you will know when to empty the canister. Some of the demerits experienced with the use of a bagless commercial vacuum cleaner are that while emptying the canister, this may cause problems to those suffering from allergies and conditions such as asthma. It may also require additional filtration. It will be a lot of work if the filters are washable and if not, then it will be an extra cost. Also, the filters need cleaning frequently. Since the suction won’t reduce as the canister fills, it may, on the other hand, reduce when the filters start getting clogged. Overall, it is a very messy affair, emptying the canister. For large area cleaning solutions, the best method for cleaning is to use a heavy duty commercial vacuum. And some of the best ones contain some features that make it the best choice to use. Regarding the main use, it is better to look at the features it has so you can understand what vacuum to use and where to use it. 1. For the hard floor cleaning, the best choice is an upright commercial vacuum cleaner. They also come in handy in carpet cleaning. 2. When it comes to cleaning walls and baseboard, a commercial grade vacuum, especially the upright model is the best choice for the job. 3. Cleaning of multi-story building and spaces such as the stairs, a lightweight and maneuverable vacuum cleaner is better to use. 4. In spaces such as those of an office or hotel, a commercial vacuum cleaner that is quiet, yet powerful enough, but only producing minimal amounts of sound is the best to use. As illustrated above, those can be the areas in which to use a commercial grade vacuum cleaner. These are not the only places. When cleaning the home, the regular vacuum can be used, in areas such as underneath tables and chairs, this type of vacuum will do well. Also, when it comes to cleaning the carpet you can use either type of vacuum. So models such as regular upright, canister or commercial vacs could help in these situations. It don't really matter if it's a bagged or bagless vacuum, all these will still be a good option for the regular home vacuum. For spaces such as workshops and offices, you need a powerful vacuum. At this point details such as the motors or turbines and fans are to be considered. From attributes such as the suction power to the tank capacity including the structural integrity and power consumption are to be taken into account. That is not all, the features of a industrial strength vacuum are the very reason you should consider before selecting a the vacuum, whether for the office or the garage. 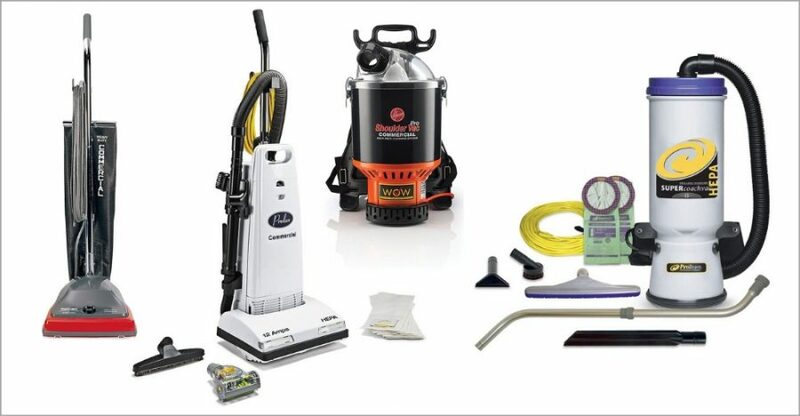 Elements such as replacement parts and toolkits to be used with the industrial vacuum cleaner are also to be selected and purchased carefully. Besides, the price of the industrial vacuum is another consideration, owing to the user whether one chooses a cleaner, or a regular one and this will depend on the task at hand. From hard surfaces to edges and depending on which material is being cleaned. The choice and method of application with the commercial grade vacuum cleaner is to be given due consideration. Unlike traditional cleaning methods, an industrial vacuum will undertake the job of polishing after cleaning as it may contain brushes for the job. It can also be used to clean any surface and will dry it at the end of the job. If you are dealing with spills on the floor, the commercial vacuum are multi-function and will clean not only a wet surface but also dry it. The surface to be cleaned, be it a hard surface, or any other including wood surfaces, the professional vacuum will come in handy being designed for the task. Also, elements such as oil spills in garages can be cleaned using this kind of vacuum, and it will leave the surface sparkling clean. For the most part, heavy duty commercial vacuums is easy to use, will clean many types of surfaces, from inclined to rough surfaces and leave the area sparkling. The best commercial vacuum cleaners all have their merits and benefits, but there is one model that stands out from the rest with its quality, power, and efficiency. Our number one pick out of all ten reviewed though is the ProTeam ProVac FS 6. Without a doubt, this is the ideal choice for any small business or professional vacuum cleaning business. The Provac FS 6 delivers enough airflow and suction to deep clean carpeting or bare floor, and it comes with many attachments for making everything spotless with minimal effort. Best of all, it’s easy on your back and shoulders, and you are less likely to cause yourself a repetitive stress injury using this vacuum than even a standard lightweight upright model. When you are ready to upgrade or replace your existing business or work space vacuum, we would suggest the best value for the money is going to be the ProVac FS 6. Give yourself some peace of mind about keeping your establishment or your clients’ properties in prime condition; invest in a ProTeam ProVac FS 6 today.